ACT Inflatable Lifejacket Services will be available to service inflatable lifejackets from Saturday the 1st November until Wednesday morning the 5th November for those that have not had their jackets serviced prior to the Trout Festival. I should also have some MARLIN Atlantic Manual jackets for sale at a show special price of just $85 each. The RRP of this jacket is $139. I have attached a picture of the style of jacket and if anyone comes to Buckenderra I will be setting up my Marquee as is in the photo near the boat ramp. My boat will be on display with the Kapten Boat Collars fitted for those that would like to have that extra stability. You can come for a quick run if so desired. Looking forward to catching up with some old acquaintances again. I can do a loan of jackets in the mornings and change over in the afternoons. 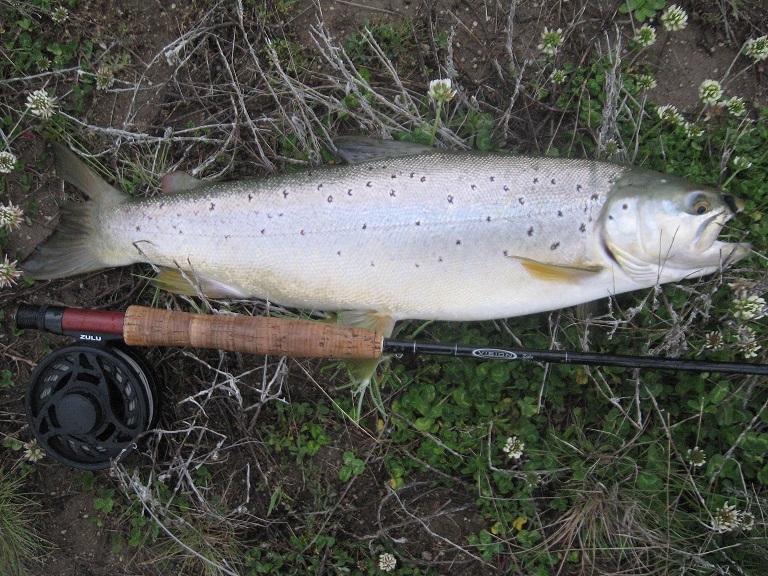 Hey mick and ray, caught this brown at Buckenderra on a black nymph early evening and lost one on the Corduliid. thanks tory. The winner is judged on the best five fish for each angler, with 10 fish allowed to be weighed in over the three days per angler. 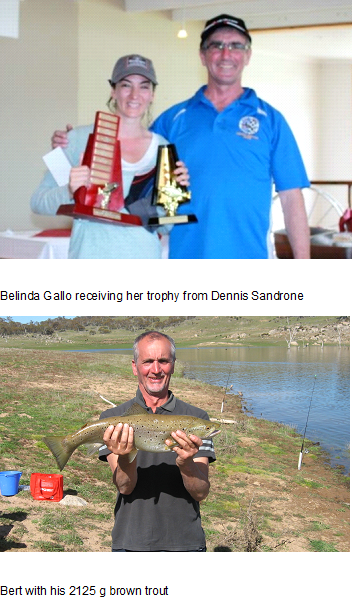 This year’s competition winner was Belinda Gallo with five fish weighed in for a total of 8220 grams. This was Belinda’s first time in the competition and she smashed the competition record. The junior section was hotly contested and the winner was Jake Watson with five fish weighed in at 4899 grams which was fifth place overall which was a great result. The weather was great over the weekend following a very cold southerly change earlier in the week. Nearly all the fish were caught by trolling with a wide range of lures working and the bait fisherman had little luck but did pick up some big browns on scrub worms. 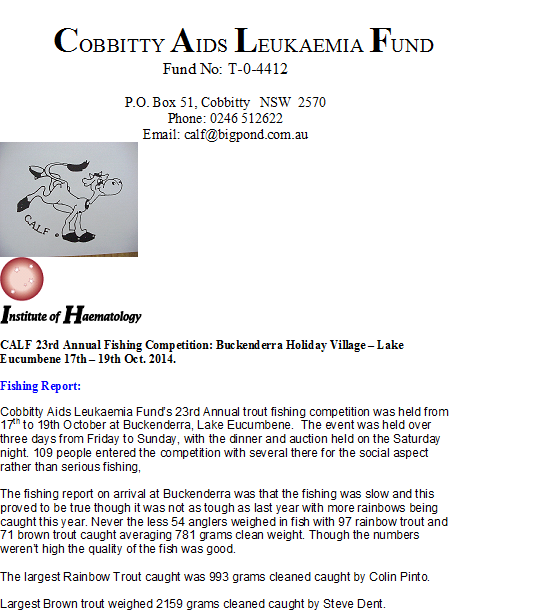 This year’s event raised well over $12000 for R.P.A Haematology Unit, Sydney for research and patient care. The event is held every October at Buckenderra Holiday Village. The generosity from the fishing and boating industry is overwhelming.